Even though it tends to run more like a PowerPoint presentation than a full priced video game at some points, Earth Defense Force 5 is such a fun guilty pleasure. “When the whole world turns into a battlefield, all we can do is fight.” What a profound quote from a game where you shoot down legions of 13-meter-long ants and laser gun wielding frog-men the size of buildings. In a society where we’ve become accustomed to stepping on eggshells, hoping not to hurt anyone’s feelings, Earth Defense Force continues to be that Japanese-flavored mirror reminding us not to take ourselves too seriously with a healthy dose of B Movie goodness. The series’ latest installment does well to continue being the quirky shooter fans fell in love with, but with an unexpected focus on story, EDF5 manages to ride a comfortable line between absurdity and drama that kept me engaged during even the toughest of battles. Though the story itself is still the defense of Earth (preferably as a force), the game is almost unrecognizable from its predecessors due to the change in pace. You’re given a lengthy tutorial, even starting as a civilian soldier, then faster than ever before in the series, you’re facing alien hordes head-on, valiantly tearing through armies and making a name for yourself within the EDF. The overall plot acts as a soft reboot to the series, re-initiating the player to iconic alien types, introducing new monsters, and taking us all the way to the start of the invasion, 2022. Dialogue can range drastically from serious news broadcasts tallying death counts, to good intentioned civilians starting ‘peace riots’, to one hopeful soldier betting that the aliens are allergic to water like in Signs (which has a hilarious payoff in a later rainy mission). There’s even a handful of illegal alien jokes that land super well, considering the USA’s current debates on immigration. Sadly, the game doesn’t accentuate these moments with subtitles, meaning these creative bits of localization gold must only be heard to be appreciated. Being the first game in the series designed with the PS4 in mind, graphical improvements have been made. Lighting is impressive, and textures show more detail than ever. Craters, damage markings, and blood effects are now present but never look good enough to be believable, adding to the cheesy nature of the game, and weather has been added to varying effects, such as low visibility. Unchanged from the rest of the series, however, is performance. Earth Defense Force 5 does not run well. Double that when it comes to local co-op. Though not surprising, it’s almost amazing how much Sandlot has managed to bog down Sony’s powerhouse of a console. By filling the screen to an almost unrecognizable number of enemies, weapon effects, giblets and collapsing buildings, the devs kept their EDF streak going strong with yet another jittery mess. On one hand, newcomers might be turned away by the poor performance, but on the other hand, and as a longtime fan, the constant framerate dips and screen tearing just lets me know I’m alive. It’s all by design at this point, and the game itself plays just as good if not better than ever. Quality of life improvements have been made in spades. Weapon and Armor pickups now trickle down to the rest of your classes so they’re not completely barren when you change characters. Weapons now upgrade automatically upon pickup, instead of piling up as duplicates. And a new equipment slot has been added for all classes, ranging from simple damage buffs to game changing upgrades. All four Soldier classes from the previous game have returned, each with their own upgrades. The Ranger is a ground assault trooper who uses ballistic weapons, vehicles, and grenades, and is still best class for beginners. New to EDF5, he can now sprint, nullifying the need for transport vehicles, and his new equipment can help him sustain or deal more damage. The Air Raider is a support class. He provides health and shields for the main troops, while also calling in vehicles and using a targeting laser to command the Air Force. The Air Raider is most effect in co-op, and the equipment trickle-down helps you jump right into a co-op game without too much grinding, unlike previous games where you dreaded having to start all the way back at Mission 1 just to level your support. Lastly, the Fencer is a hulking beast of a man. He wields two sets of one-handed weapons ranging from Spears to Shields to Hammers to Gatling Guns. Now I’m not explicitly saying that playing as the Fencer is exactly the same as playing Dark Souls, but playing as the Fencer is basically the same as playing Dark Souls. He can dash, his health beats out everyone in the EDF, and his damage is intimidating, able to take down an entire building with one melee smash. Being the newest addition to the series (only being introduced in the last game), his playstyle continues to offer a drastic change of pace that requires a knowledge of the game and its workings, as well as a keen eye on the battlefield. His new equipment slots (which he uniquely has two of) lets you upgrade stats like walking speed or shield durability. 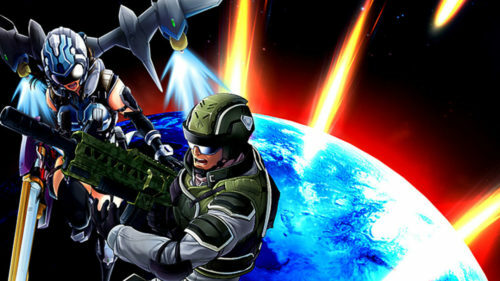 Earth Defense Force 5 is the kind of game you can play for hours on end and still be entertained. Co-op remains fun as ever (though in local you’re stuck with an ugly vertical split-screen), and the faster pace and variation from the previous games makes this the most engaging EDF yet. Add to that the higher difficulties offering improved Weapons and Armor and there is no lack of replayability. The quirks of the series are an acquired taste to be sure, but this has proven itself as a great EDF game for veterans and newcomers alike. I feel almost dirty recommending Earth Defense Force 5. Even though it tends to run more like a PowerPoint presentation than a full priced video game at some points, it’s such a fun guilty pleasure, packed with dozens of hours of content, that I can’t help but give it a pass. My name is Zack and I write about video games. I'm going to college majoring in journalism and the video game industry has been my passion since I was 14 years old.